Looking for an easy solution to your laboratory needs? Avon Modular is proud to introduce our partnership with “Lab in Boxes”. What is Lab in Boxes? Lab in Boxes is a group of laboratory suppliers that have joined forces with Avon Modular to bring customers like you an innovative complete Turn Key Solution to your laboratory project. With over 20 years of experience in designing and installing labs, Lab in Boxes understands the importance of planning the layout of a laboratory based on the method and workflow of the users. This modular laboratory building system allows us to deliver and finish a new laboratory in record time, allowing you to quick start your operations. Avon Modular laboratories can support a wide range of operations traditionally carried out in conventional laboratory buildings. Modular laboratories can serve as single stand-alone labs, as well as auxiliary labs that enhance the current capabilities of existing facilities. Modular laboratories also offer a faster completion timeline, unsurpassed flexibility of operations and heightened levels of bio-containment. What facilities can use Modular Labs? Modular laboratories can be used for a full range of applications that are carried out in traditionally built laboratory buildings. Lab in Boxes are highly suitable for use as national and regional laboratories and as additions to universities and other research labs, as well as auxiliaries to enhance current lab capabilities. Modular labs also play a key role for military labs and other security applications, as they can be built to include enhanced biosecurity and access controls. Avon Modular, along with Lab in Boxes, has over 2o years under their belt of designing and planning modular laboratories for many industries, including Petroleum, Pharma, food, water quality, education and healthcare. 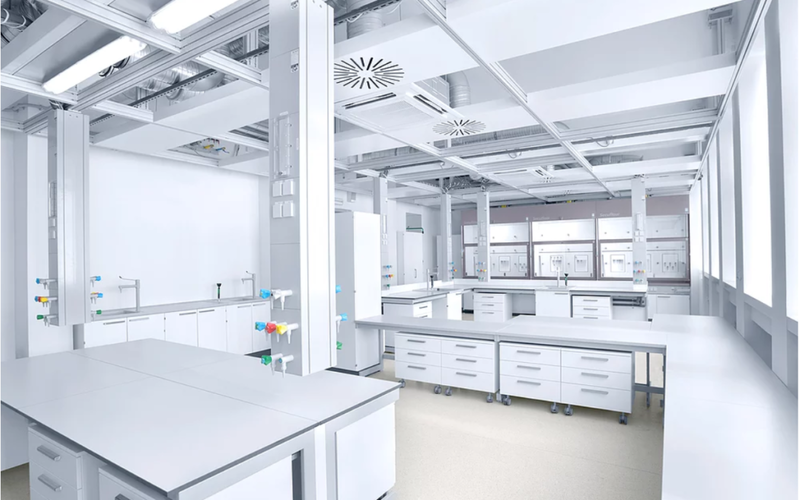 We can equip your new lab with the best cutting-edge technology and custom build furniture to fit your specific workflow and laboratory needs. Want to learn more about Lab in Boxes? Contact Avon Modular today to speak with our experienced design team to discuss your modular laboratory project. Avon Modular specializes in modular construction and prefabricated buildings as it can offer tremendous savings and quality permanent building products to customers. Over the recent years, Avon Modular has developed a one-stop shop including general contracting, and architectural services under one roof which gives them the advantage to expedite any project. Avon modular is a registered modular manufacturing company with the State of Florida (MFT 8686) and specializes in all types of commercial modular building manufacturing. Also, Avon Modular, as a Certified General Contractor (CGC1521397), provides the ease for customer building projects to be managed by qualified construction experts who care about providing high-quality buildings in a fast, efficient manner. Building in today’s market can be costly, explore a more effective solution with Avon Modular. There are a growing number of construction companies turning to Avon Modular for the flexibility, ease, and cost-effectiveness that is offered. The Avon Modular team strives to treat each project as if it were it’s own while providing the finest personal service and quality product that would make any owner or company proud. What is Modular construction and How Does It Work?